Pizza is the point at Bocce: Here’s the scampi pie with garlic and heirloom tomatoes. I should be frank, for starters. A gathering crowd is jockeying for seating, but the two women who join me at Bocce on a humid evening last week are not impressed. The table I reserved takes a while to empty. Our server races around, overwhelmed and elusive. 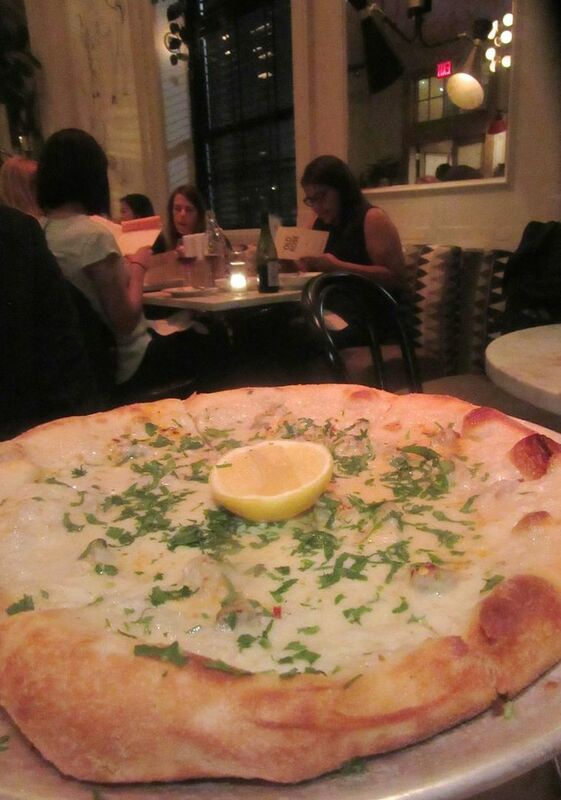 My companions don’t seem as pleased as I am by the garlicky scampi pizza or the refreshing cucumber salad with horseradish, a crunch of pistachios, and pecorino. 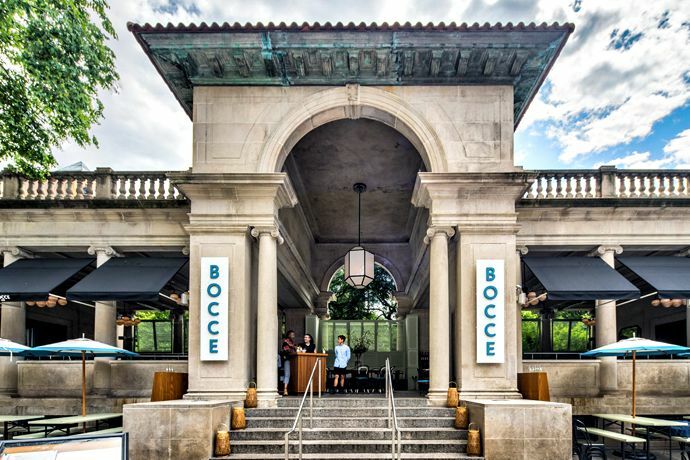 The Bocce bread bubble with whipped ricotta is a must here, even if you’ve ordered pizza. What does excite us all? The Bocce bread, a warm balloon with a knife stuck in for ripping off a rag to mop up whipped ricotta and olive oil. 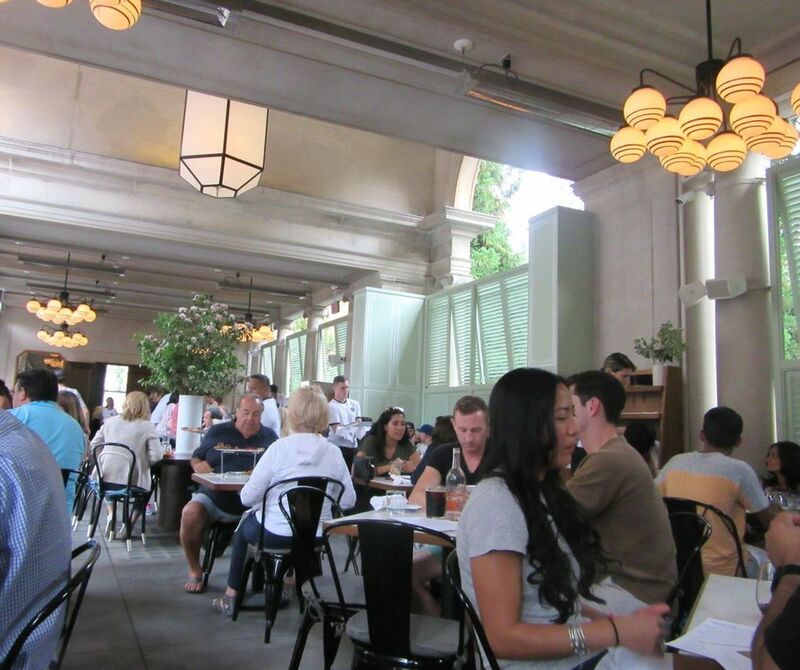 That bread is this year’s triumph of the Union Square Pavilion’s annual June arrival. 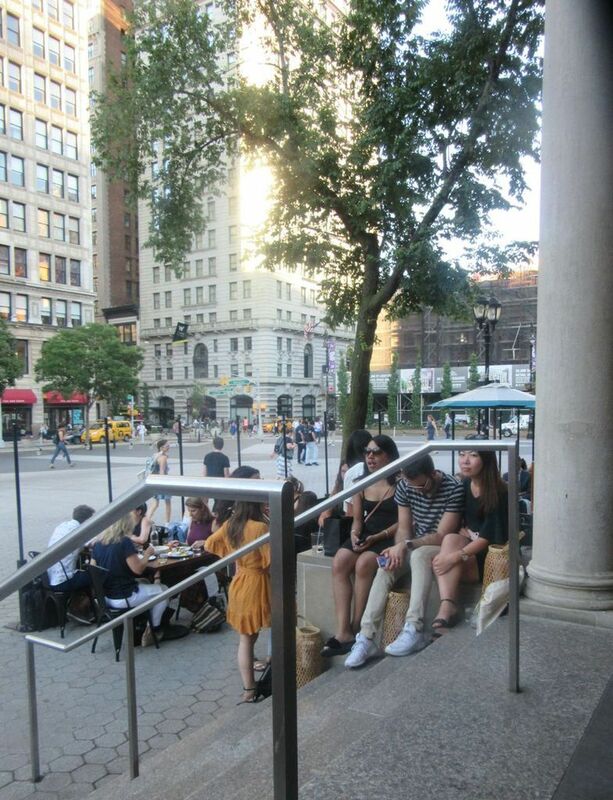 I found this view of the Union Square Pavilion on Urban Daddy. I hope they don’t mind sharing. 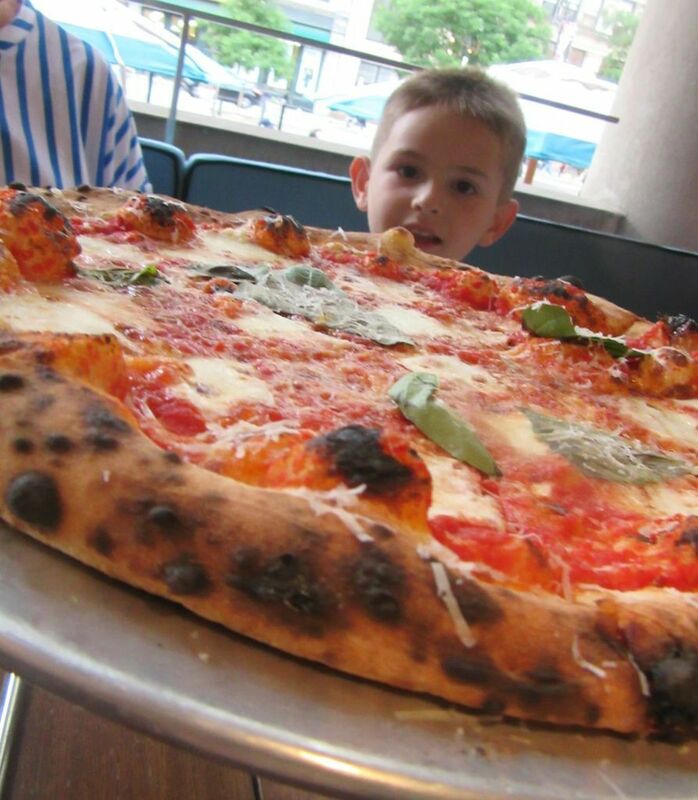 The crowd favors millennials and younger but we grownups want pizza bread too. There are shades now on the open arches to protect from rain (though probably not from torrents worthy of action by Noah). New entrepreneurs have hung good-looking light fixtures. 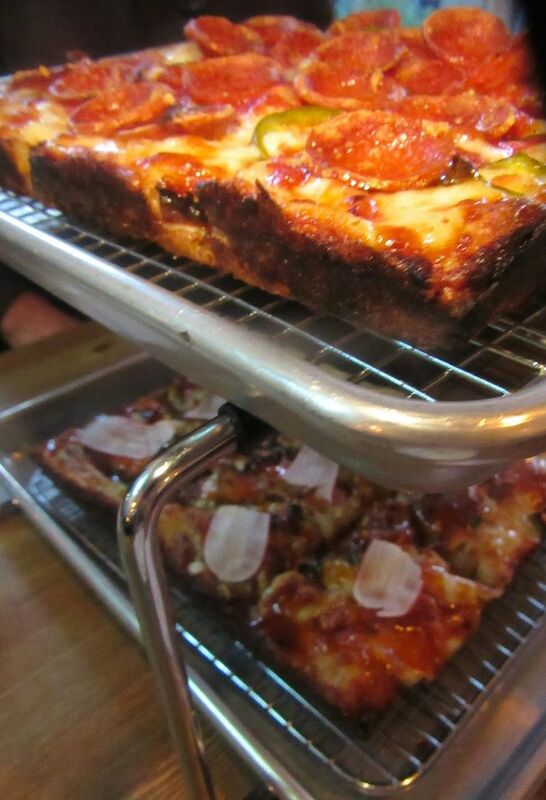 An eclectic crew rushes with pizza racks and plates. And the attractive young guardians at the top of the steps are solicitous. Young Teddy is absorbed in Mom’s phone until his cheese pizza arrives. Minus oregano, of course. Snap pea Caesar with mint, black pepper and Parmesan is crunchy market fare. Pasta is a must tonight. 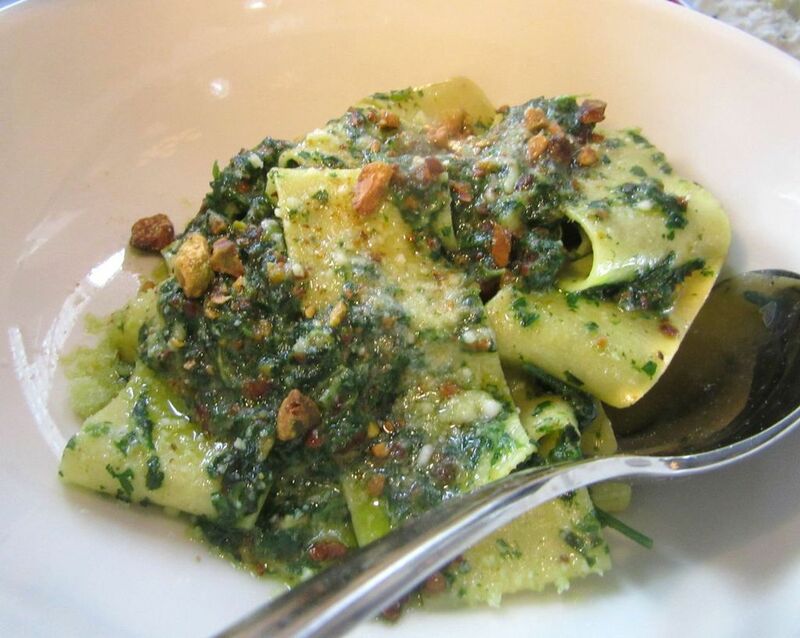 We share pappardelle with pistachio and excellent market pesto. Wishful dreaming. The kitchen is slow, but sipping my frozen Negroni dulls the pain of waiting. 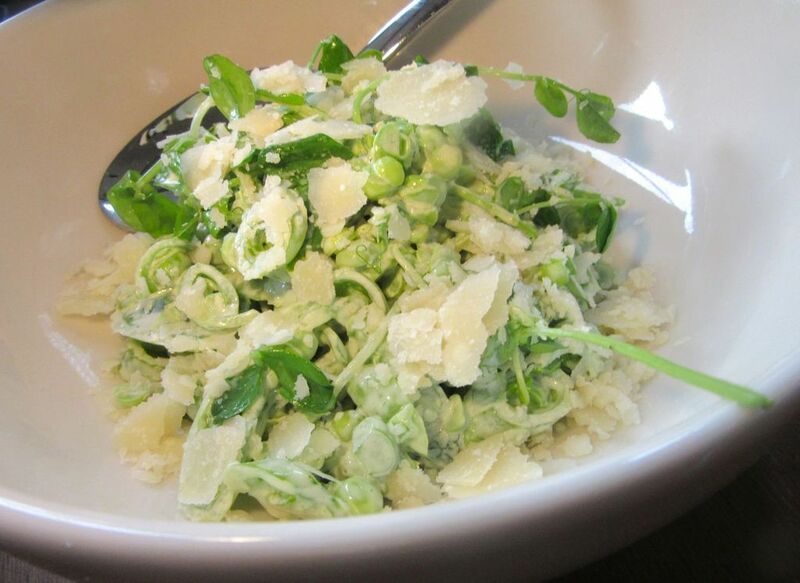 We have time to share the snap pea Caesar with crisp torn leaves of romaine, favas, mint and Parmesan shards. Don’t assume the pappardelle, with its market pesto and more pistachios, will be properly al dente, but appreciate the slathering of greens and breadcrumb crunch. The Farm pizza is paved with chilies, green garlic, market greens and herbs on fresh mozzarella. I’ve not eaten with Teddy for a while, so I’m impressed that this diminutive person can calmly put away half his oregano-less pizza. 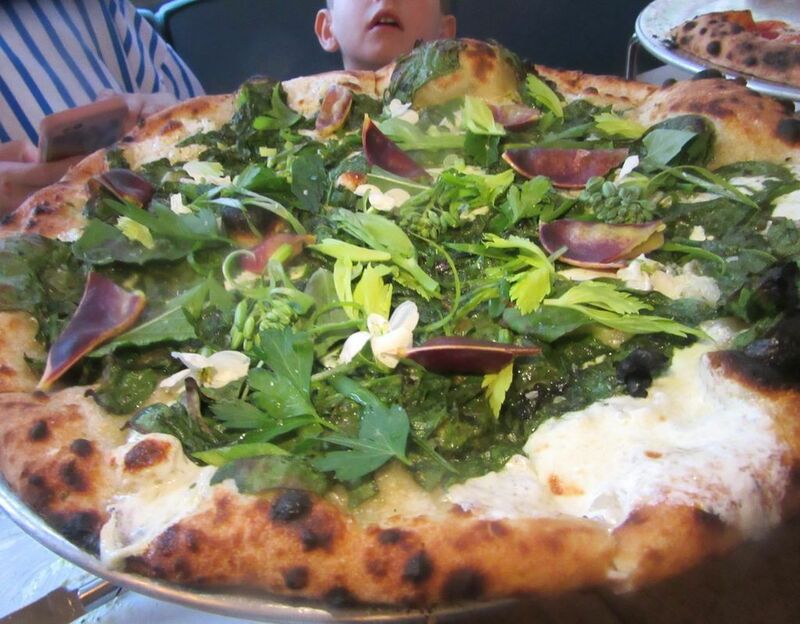 We’ve chosen the Farm pie for the grownups: a tumbled hedge of greenery, green garlic and chilies on a mozzarella base. I arrive early and perch on a bench to watch the patio and entrance drama. 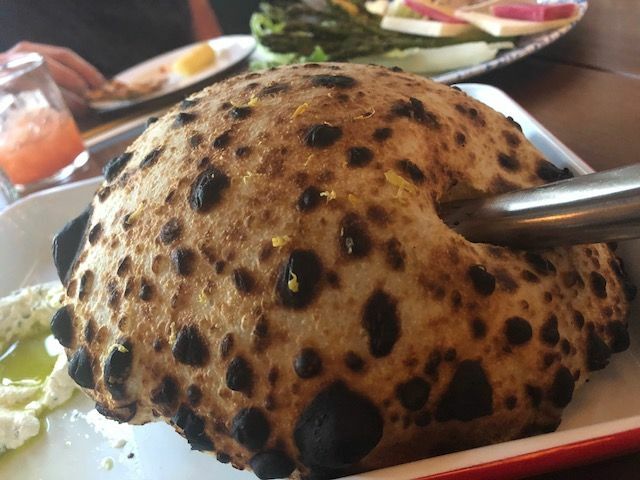 Given the irresistible temptations of blistered dough and the commanding cloud of bread, it’s no surprise that none of us has appetite left for dessert. Teddy shows signs of being ready to conk out on the drive home. 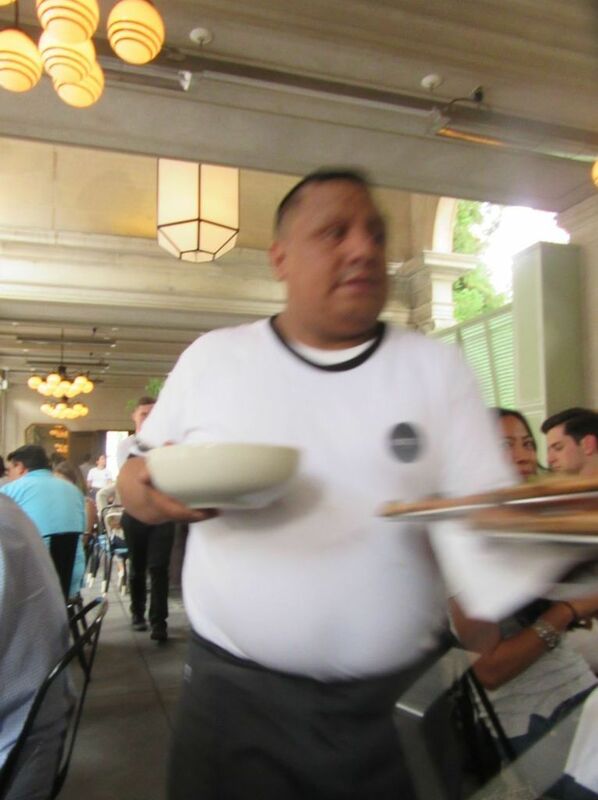 Waiters swerve and race to rush food to the multitudes. Turnover is profit. It’s much warmer Tuesday and very humid. I’m ridiculously early and can watch the tiled patio action, waiters flinging themselves down the steps, carrying multiple pizzas. Penny is late, but so is our promised table. She and her friend I’d forgotten I know have much to talk about – rentals in East Hampton, a wedding in New Orleans, summer vacation in Capri. 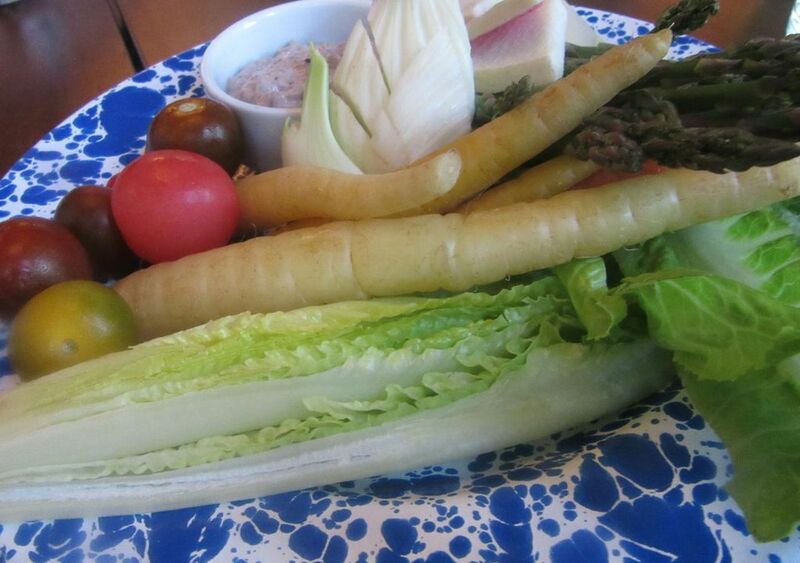 These summer crudités strike me as a bit too crude yet a good excuse for devouring olive mayo. 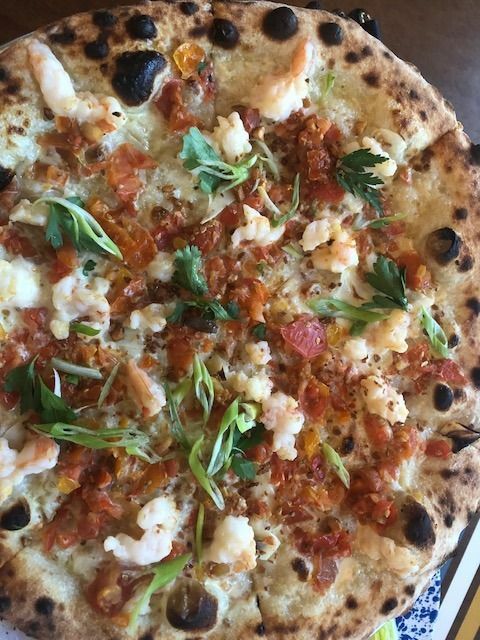 The Bocce bread gets their positive attention but they don’t seem as moved as I am by the scampi pizza with garlic, heirloom tomatoes, and tender little shrimp cooked in white wine. Given the vast daily market and farm stands here, I expected a more eclectic collection of crudités to dip in olive mayo. 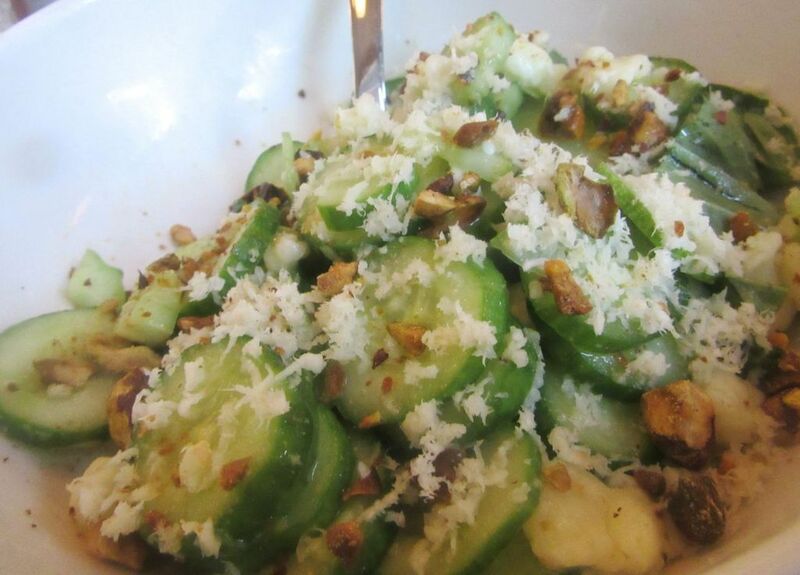 Don’t overlook this lively cucumber salad with horseradish, pistachios and fresh pecorino. 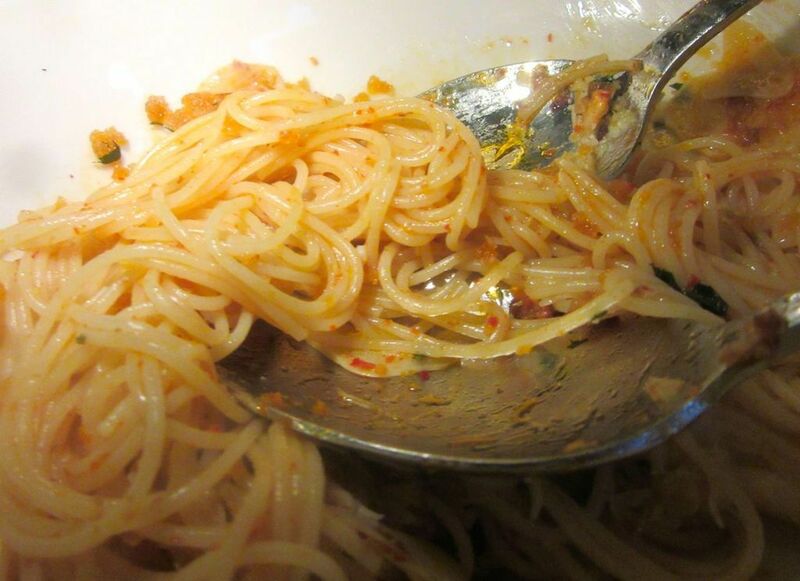 The lemony capellini with blue crab and parsley won’t be al dente but who cares. The lemony capellini with blue crab and parsley has gotten a little sticky and soggy as they swirl up seconds and I wrestle with thirds. I had meant to order fritto misto (I probably forgot because so many of my dining regulars have give up fried foods), so belatedly, I ask the waiter to bring us an order. 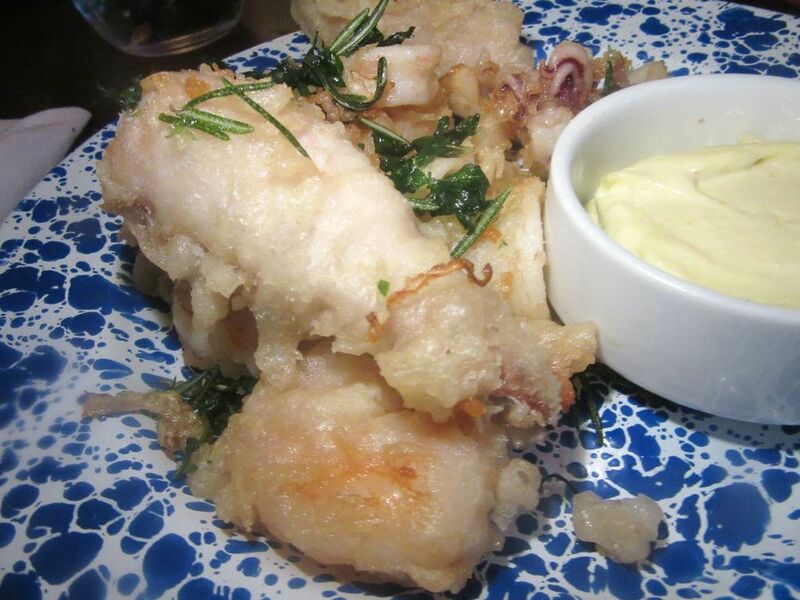 A last minute order of fritto misto arrives freshly hot and crisp from the fryer. 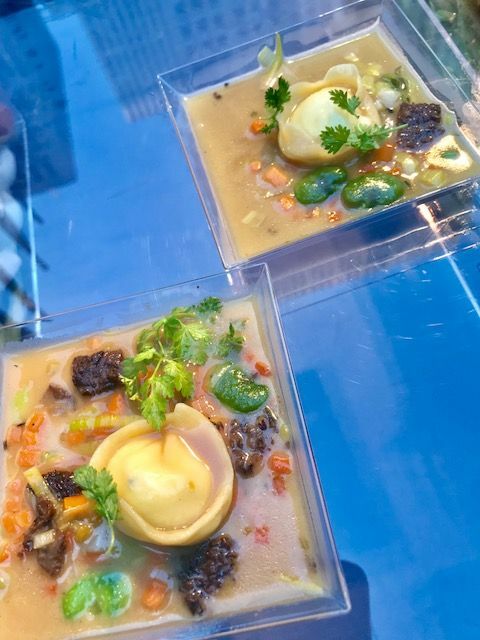 It gets set near me on a mottled blue tin plate, and I take a shrimp, a calamari tentacle and the huge chunk of battered porgy poised on top, plus a spoonful of garlic aioli. Though not especially well-browned, the fried sea creatures are remarkable, really hot and fresh. My pals nibble, but don’t seem to notice how good the dish is. And you can play bocce too. Credit cards only. Cash not accepted. 20 Union Square West, 17th Street side. 212 677 7818. Sunday noon to 10 pm. Monday 5 pm to midnight. Tuesday through Saturday noon to midnight.